A Phi Beta Kappa graduate of DePauw in 1890, Roy O. West was admitted to the Illinois bar that same year and rose to national prominence as an attorney, political leader and presidential cabinet member. He was appointed city attorney for Chicago in 1896, served as chairman of the Illinois Republican state committee 1904-14, secretary of the National Republican Committee 1924-28, and as Secretary of the Interior in the cabinet of Calvin Coolidge. 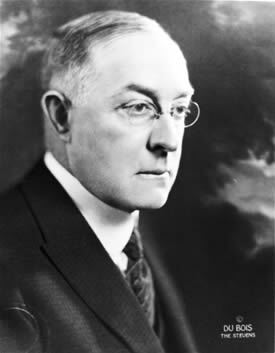 He became a member of DePauw’s Board of Trustees in 1914 and served as its president from 1924 until his retirement in 1950. Through his influence with alumni and friends of DePauw, he was responsible for more than $10,000,000 in gifts to the university. He also encouraged his close friends Edward and Lucy Rector, to donate the money for the building of Rector, Lucy Rowland and Longden halls and to establish the Rector scholarship fund, one of the largest single-grant funds in the world. For his outstanding service to his country and his university, Roy O. West Library, dedicated in 1956, was named in his honor.